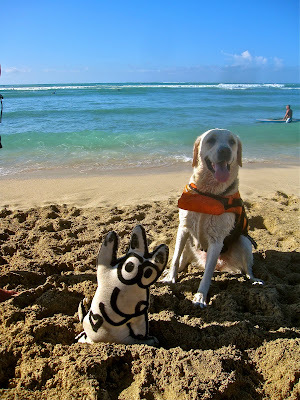 On the water in downtown Honolulu is REUSE HAWAII. I love this nonprofit! It's a demolition company that deconstructs or takes apart structures and saves the materials so they don't go into a landfill! Follow along as I journey through the warehouse and lumber yard. I love windows! Using natural light is free and the green way to go. These windows would have ended up in a landfill if not for REUSE HAWAII. 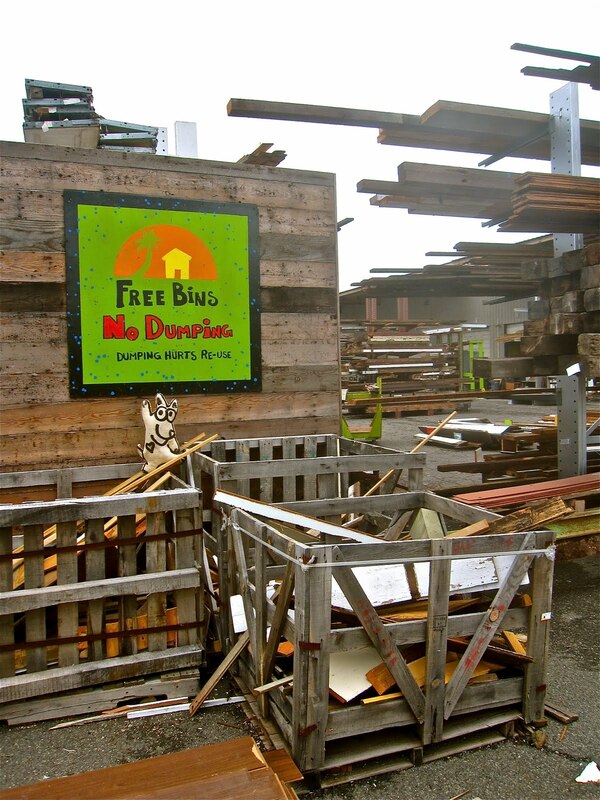 Each year this non profit saves 1,000 tons of building materials from going to the dump! This is just one side of the extensive lumber yard. You can call Reuse or come in and request something special and if they get it in, they will call you. Now, that's what I call service! The plants are for decoration only; this place is clean, vibrant, airy and hospitable. It's a great place to visit and save money. You know those stools that are going on the bike path? They would cost $300 each if purchased new instead of $40! 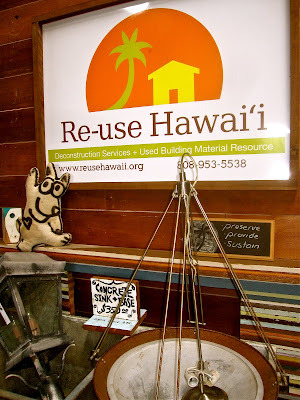 Yes, you can even buy a little row boat at Reuse Hawaii. If you are interested, "hele aku" which means "go" in Hawaiian, on down to 33 Forest Avenue in downtown Honolulu and take a look. It's on the harbor side of Restaurant Row. Doing a little home improvement? Building a playhouse? Want to save money? Reuse Hawaii might have just what you need and you'll be taking better care of the planet, too. I like that idea!! How do I look in bunny ears? That's Matt, the lumber yard manager, clowning around with me. He assisted Mom with the purchase of the concrete stools for the Bike Path. 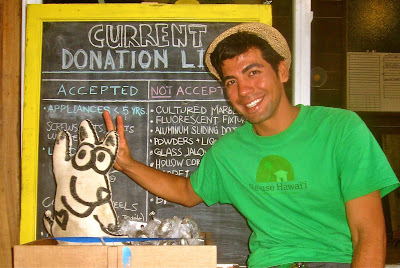 He loves working at Reuse because he's an artist who uses recycled materials. He stated, "I have the potential for creating art from found objects". Matt's my kind of guy---Reduce, Reuse, Recycle!! 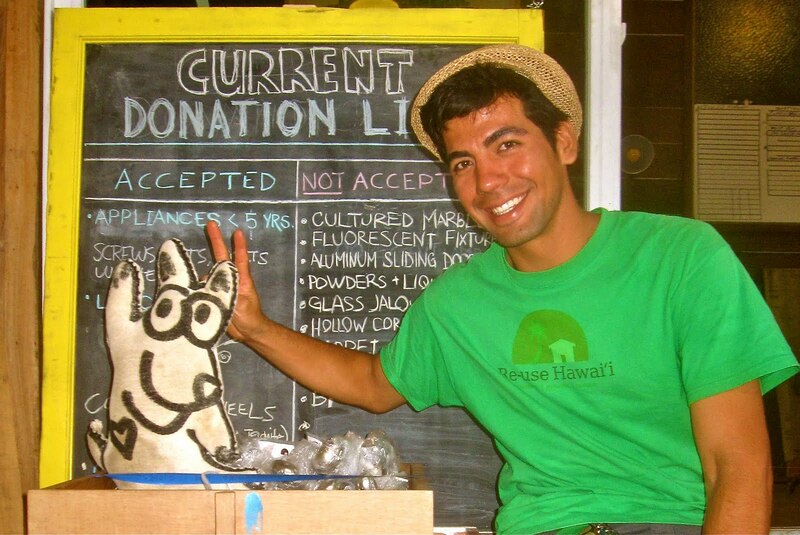 Yes, Reuse Hawaii has free stuff. Think about it--you can build a bird house, a dog house, a play house, etc. Jeff Gere has the most wonderful job of all. He tells stories. 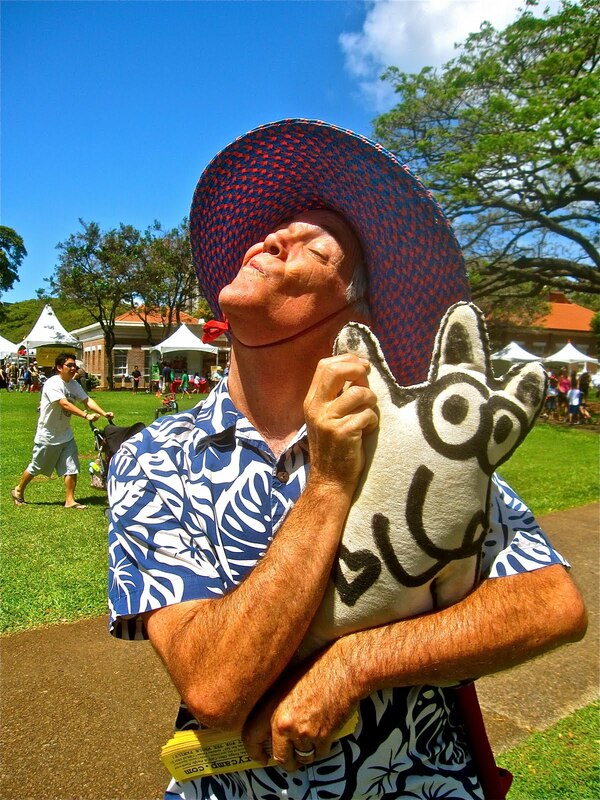 Jeff has been employed by the City and County of Honolulu for thirty years---his job----storyteller. 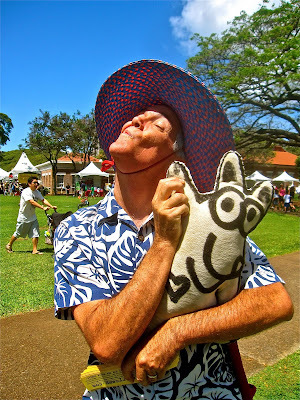 He was at the 6th Annual Hawai'i Book and Music Festival passing out flyers for his big summer event--a storytelling camp at Kualoa Park. Go to: www.talkstorycamp.com to find out how you can become involved. Can you see from the photo that Jeff likes to clown around! 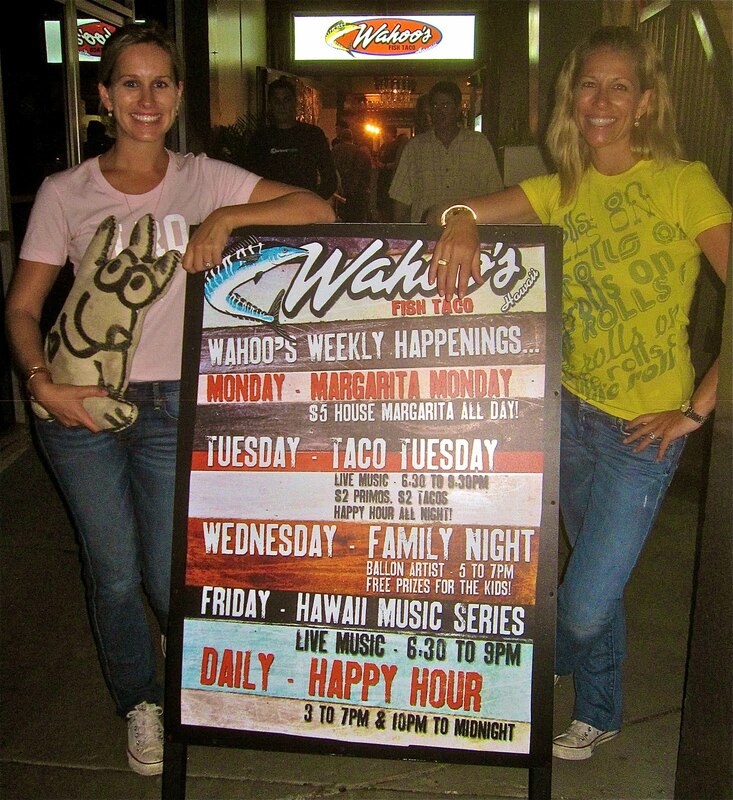 Catherine and Jessica are from the Searider Media Production Class of Waianae High School on the west side of Oahu. They volunteered at the Festival and told me this was very different from what they are used to doing--"usually we don't talk to people". They talked to me and that made me happy! Talking is good, in my opinion. Can you guess who I am in these big red ears? I'm a famous character in children's literature. Scroll to the next photo and see Mom and me with the owner of the ears. Yes, those big red ears belonged to "Clifford, the Big Red Dog". I love other dogs, and I especially love other dogs who get children to read!! Keep it up, Clifford! 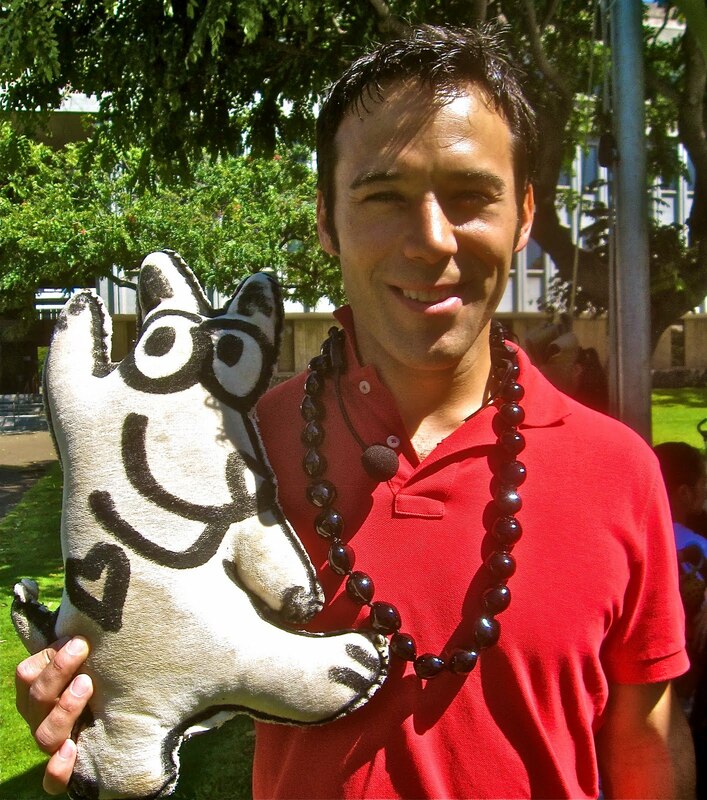 Now what is "keiki"? It's the Hawaiian word for "children". I always gravitate towards the children's area at any event I attend. It seems like there is so much more fun going on there!! Do you agree? This is Eden-Lee. 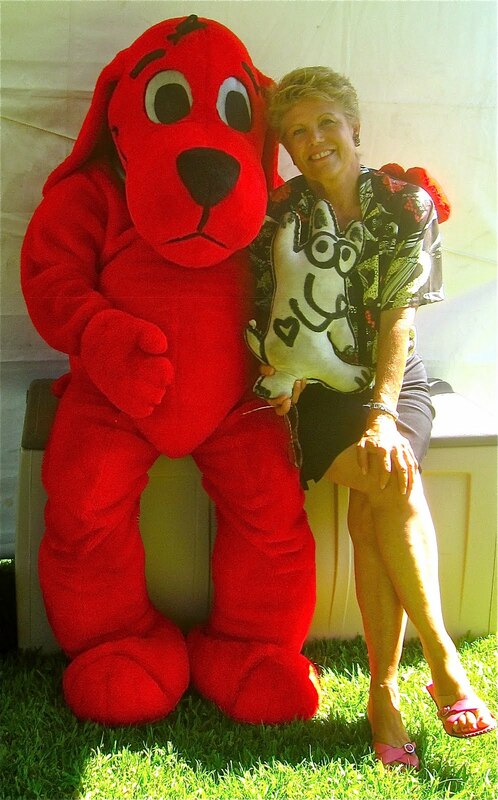 She's the wife of the organizer of the whole Book and Music Festival, Roger, and he made her the boss of the tents that were set up for the keiki. I liked the way she was holding me----I felt loved! Eden-Lee is the Education Director of the Hawaii Theatre and had her troupe putting on Shakespeare at the Festival. This is Steve Songs and he's famous. He's a singer on a PBS t.v. show. I liked him because he was kind and happy and liked to talk about children. We had a great conversation and probably that was because he used to be a teacher like Mom. I know this must look funny, but there is a hat being made in this photograph. It's a "recycled" hat. Take two sheets of old newspaper and turn them so that all the points are showing. Then take some tape and make it go around the model's head (this takes two people) to hold down the newspaper. Then just roll up the edges and, PRESTO, a new chapeau. I'm being like FANCY NANCY and using big words. "Chapeau" is French for "hat"! Google "Fancy Nancy" if you don't know who she is. She is one of Mom's favorite characters in new children's literature. FYI--Liane, the Executive Director of Read to Me International, was under the newspaper! Jessica, a student at Hawaii Baptist Academy, was lending a hand to her mom, Liane (in the photo before this one). Jessica loved making a hat for me. She had been at the booth for awhile and was just getting ready to leave the Book and Music Festival to go surfing. (Now, that's a girl after my own heart; surfing is good exercise!) 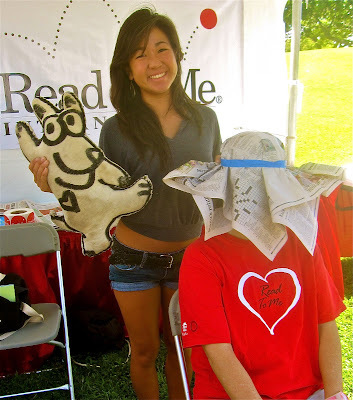 Want to know more about Read to Me International? Mom always says she'd be lost without Hawaii Public Radio. She listens to the radio every morning as she gets ready for school. 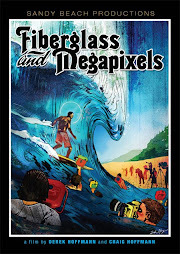 When she first moved to the North Shore of Oahu in 1974, there was no radio, there wasn't even cable. She just played Scrabble and sat by the fire on cold winter nights. Bernice helped me pick out 20 books for children. She's a volunteer from the Friends of the Library of Hawaii. All the books were recycled and cost about a dollar a piece. Pretty good price don't you think? 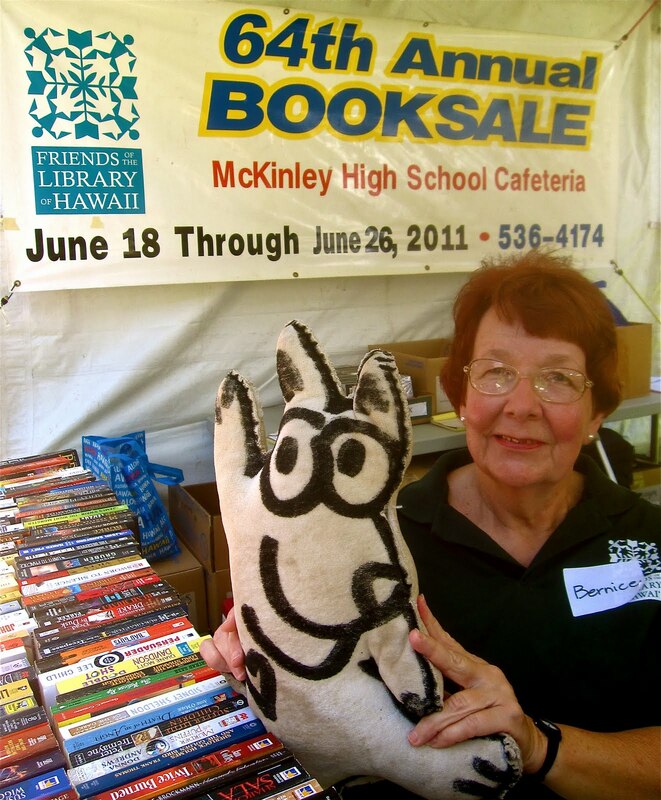 See that banner behind Bernice, go to that booksale in Honolulu for some more great deals! 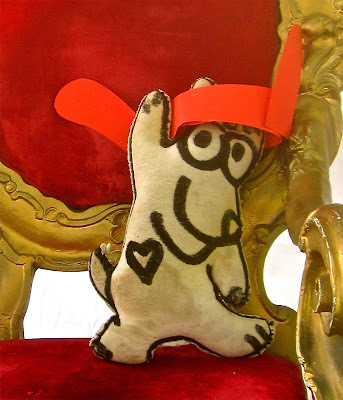 I thought Petranella was ready to head off to England to see a prince get married, but I was mistaken. 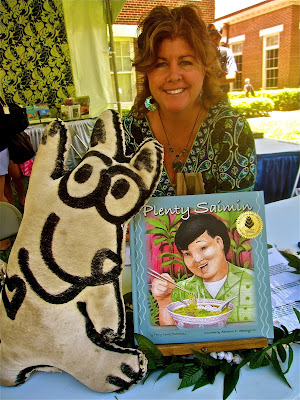 She was at one of the publisher's booth's at the Book and Music Festival. 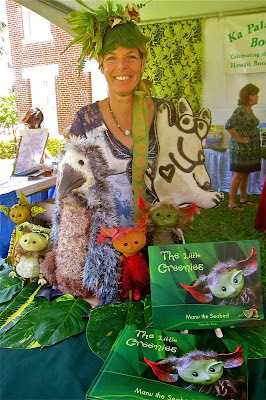 Petra wrote a fabulous book called THE GREENIES. I think we will become great friends; I love hats and little creatures of the woods, and so does she. She made those little elf-lookin' dolls, took pictures of them, and wrote her booK! 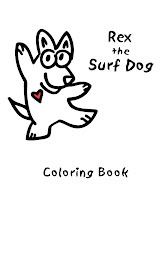 Gidget is an author----she has a series of books about a little boy named Kimo who loves to surf and has lots of adventures in the ocean. She and Mom have been close for a lot time. Gidget inspired Mom to give birth to me!! Hooray for Gidget AKA Kerry Germain. She started her own publishing company too. PLENTY SIAMIN is the first book she published for another author! Please come to the Book and Music Festival next year, same time, same place. Watch for it!! Sarah Donaldson is the Program Manager of LIfe Rolls On. 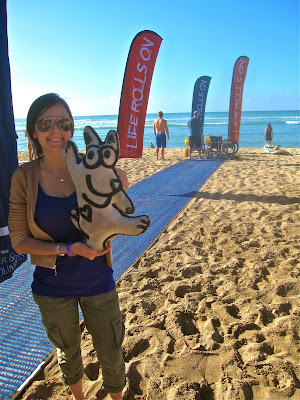 She was in charge of everything when the organizaton, a subsidiary of the Christopher and Dana Reeves Foundation, came to Oahu for the surf event! Sarah handles all the action sports--skiing, skating, and surfing events in the United States. And, guess what, they are all free!! Ethan was at the Life Rolls On Friday night event with his dad, Matt Eagle, publisher of the new surfing magazine for visitors called ALOHA SURF GUIDE. 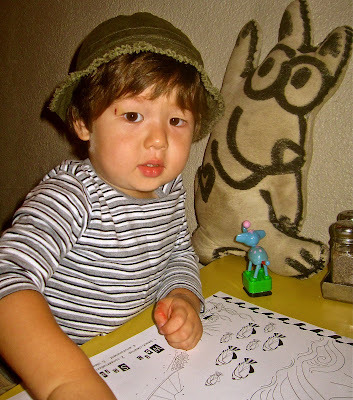 He kept himself busy with crayons and images of the ocean. 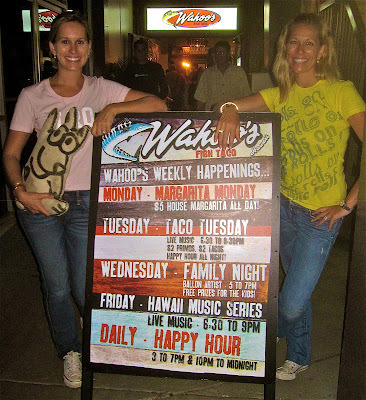 Noelle (holding me) and her sister, Stephanie, own the franchise, Wahoo's, at Kahala Mall next to the Olive Tree. They make the best fish tacos around! These young women hosted the Life Rolls On pre contest get together. There was music and laughter and lots of goodwill! 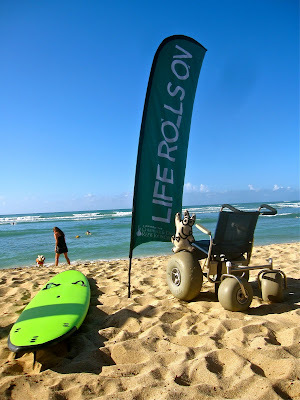 Life Rolls on supports anyone who wants to surf, no matter what the disability. There were so many volunteers at the surfing contest. Serena, a journalism student from the University of Hawaii, pitched in at the registration booth. She was kind enough to let me take her photograph next to the wheelchair runway. Kala and Keoni (on the right) volunteered to be water safety patrol for the Life Rolls on surfing competition! I asked Kala why he was at the event and he proudly stated, "To give back is important, and this experience is priceless". These two also gave me the lowdown on "White Plains", the surfing beach in Ewa, run by the Coast Guard and open to the public. It's a perfect spot for beginners and there are waves galore! Emma and I became pals on the beach at White Plains. She's a service dog for her owner, Richie, one of the co-founders of ACCESS SURF. It's an organization that promotes sports around the world for individuals with disabilities! Emma assists Richie when he's just coming out of the water after a long surf. I don't watch much t.v. Mom says she'd rather have me reading and playing outside! I can see her point. That's Jesse, holding me. He had a surfing accident several years ago and broke his neck in some big waves. 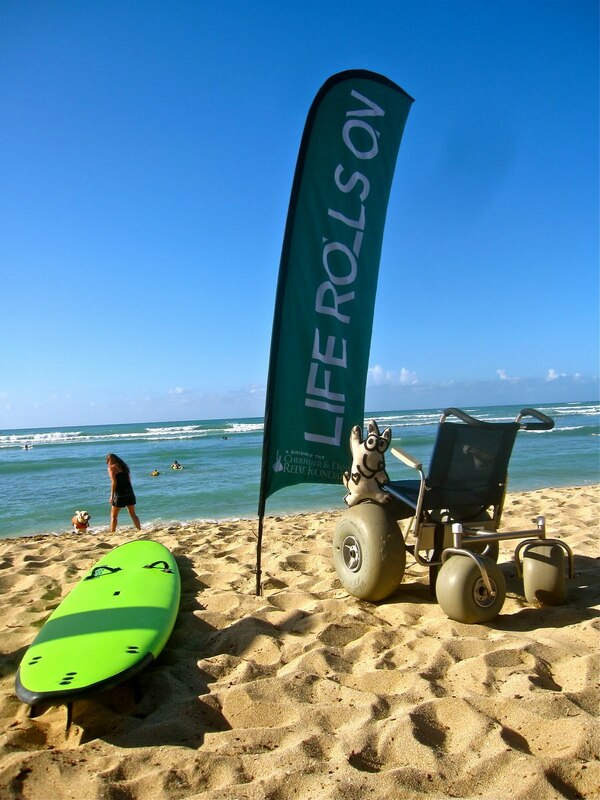 He works for Access Surf now and tests out their new equipment. Emma, the two and a half year old Lab, just had to be in the picture again! Is that what you'd call a "Publicity Hound"? 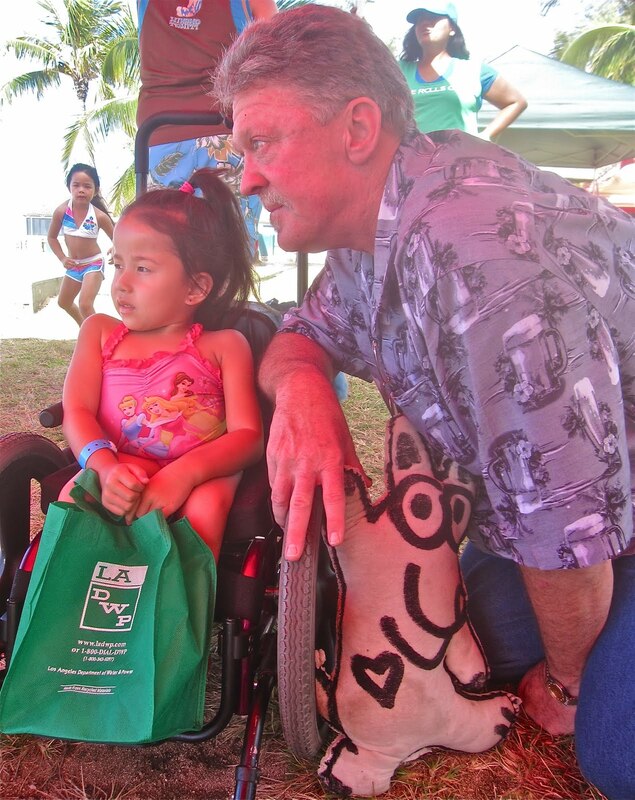 Maile and her devoted "hanai" Grandpa, Robbie, came from San Diego just to surf in the Life Rolls On contest----They Will Surf Again. They were both checking out the waves and assessing the conditions before heading out. 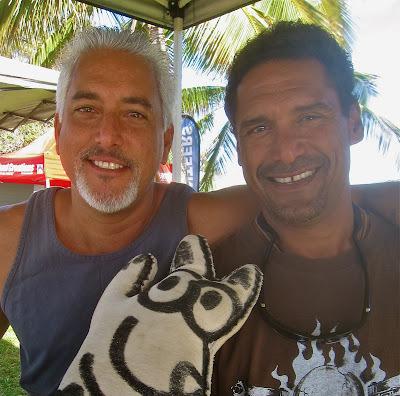 These are some of the volunteers for the surfing contest. I was so touched by how many individuals gave their time and energy making the Life Rolls On event a great success. Bravo to Jesse and Sarah and everyone else who "gives back" and makes sure kids and adults with disabilities get to surf, skate, or ski! !